Experienced ethics officers will tell you that one of the most effective ethics and compliance programme measurement tools they have is the data from their internal reporting systems. But how do you put that information into perspective so that you can report meaningful and actionable data to senior leadership and your board? 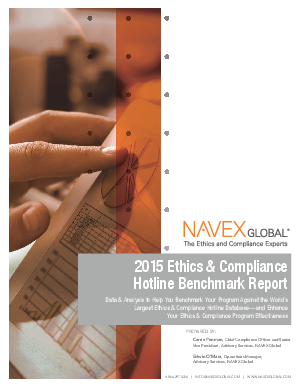 The 2015 Ethics and Compliance Hotline Benchmark Report shares the latest trends and benchmarking data from the NAVEX Global reporting database—the largest database of its kind in the world. Do our employees utlise/know about our reporting channels? Do we need to review or update specific policies? Are there key topics we can use addtional training around? Does culture support employees who raise concerns? Download this report now to to discover the latest trends and benchmarking data to provide you with an excellent starting point for assesing your organisations reporting data.